My Reckon Accounts Business is failing to send email or invoices as PDF. I cannot save it as PDF too. I get error -20 or error -30. How can I fix the drivers? How can I reinstall the Reckon Accounts PDF drivers (or Amyuni PDF driver)? Reckon Accounts Business uses Amyuni PDF converter drivers to save the invoices and other documents as PDF. Occasionally, these PDF drivers may get corrupted and fail to function correctly. We can reinstall these drivers and reconfigure it again to work with Reckon Accounts as below. Reckon Accounts Business 2014, 2015, 2016 and later users with email/PDF issues. For older version please refer to KB 4546. The PDF drivers can be reinstalled after removing the old/corrupted PDF drivers. · Reckon Accounts Business 2017 uses: Reckon Accounts V5 PDF Converter. 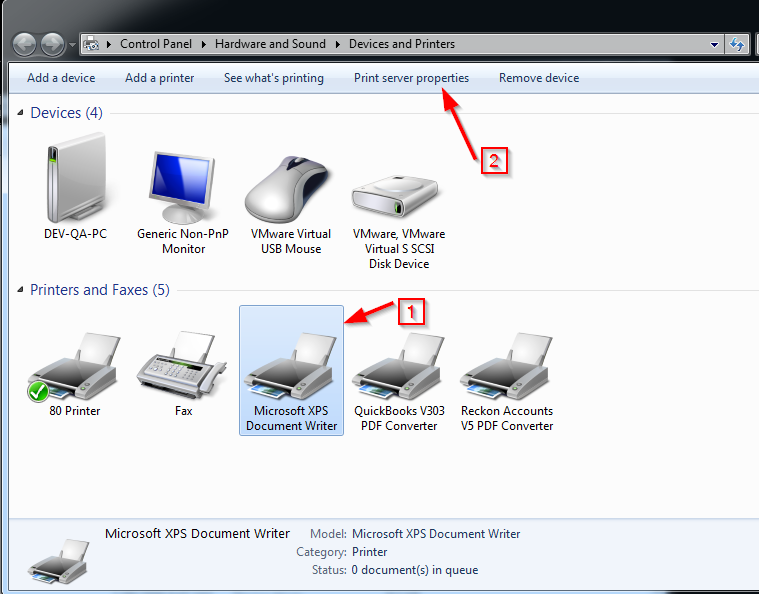 Step 1: Uninstall the old/corrupt PDF drivers from the Devices and Printers in control panel. b) Go to Control Panel and Devices and Printers. c) Select your version of Reckon Accounts V* PDF converter. d) Right Click on it and select Remove device. e) Now once the printer is removed from the list, select any other printer you see under Devices and Printers window, and select Print Server Properties on top menu bar. g) Now go to Drivers tab and select the driver for your specific version of Amyuni Document converter such as 300, 400 or 500.
h) Select remove and remove the whole package. This will remove the faulty/corrupt PDF driver from the PC. Now Proceed to step 2 to reinstall the fresh copy of driver. Step 2: Install the new PDF driver from the installation folder. The PDF drivers exist on the installation folder of Reckon Accounts. You can install it from there as below. a) Go to your installation folder of Reckon Accounts 20**. b) Scroll down to locate Install.exe application file and double click to run it. c) You will see the quick window flash indicating the progress of installation. Select OK to the message once completed. d) This will install the new PDF driver for Amyuni Document Converter. You can see this device listed on Devices and Printers window. e) Now proceed to step 3 to configure this new driver. Step 3: Rename and configure the new PDF drivers. a) Go to the control Panel and Devices and Printers from the start menu. 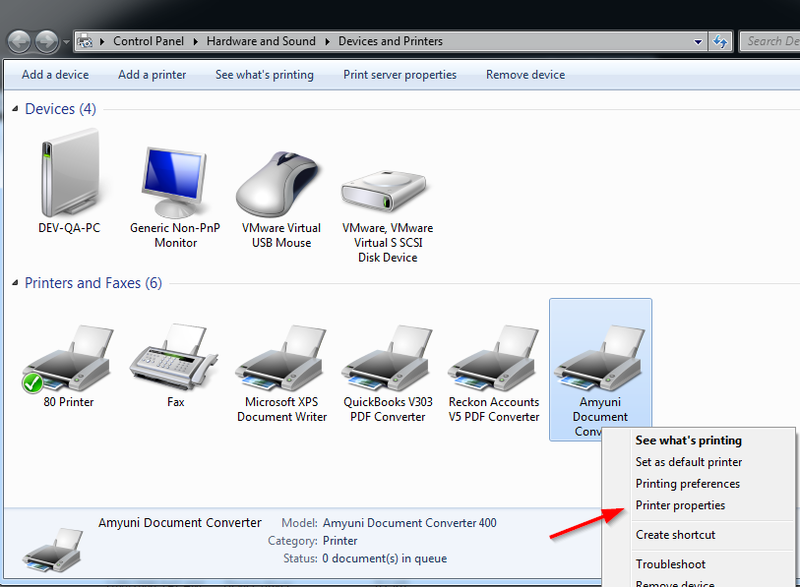 b) You will notice, new printer ‘Amyuni Document Converter’ is listed. c) Right click on it and go to Printer Properties. f) Now go to the Ports tab. For Reckon Accounts 2016 and later you should see the Reckon Accounts V5 PDF Converter assigned to the RA2016Port (or later). · click Add Port button. · Select the newly created port ‘RAB’ and click the Advanced tab. · Select Spool print documents so program finishes printing faster. · Clear the checkbox labelled Enable advanced printing features. · Select Print directly to printer. · Click the Driver drop-down arrow and select Amyuni Document Converter 400. · Click Apply and then click OK. This will conclude the process of reinstalling the PDF drivers. Open your Reckon Accounts and try to save as PDF again.